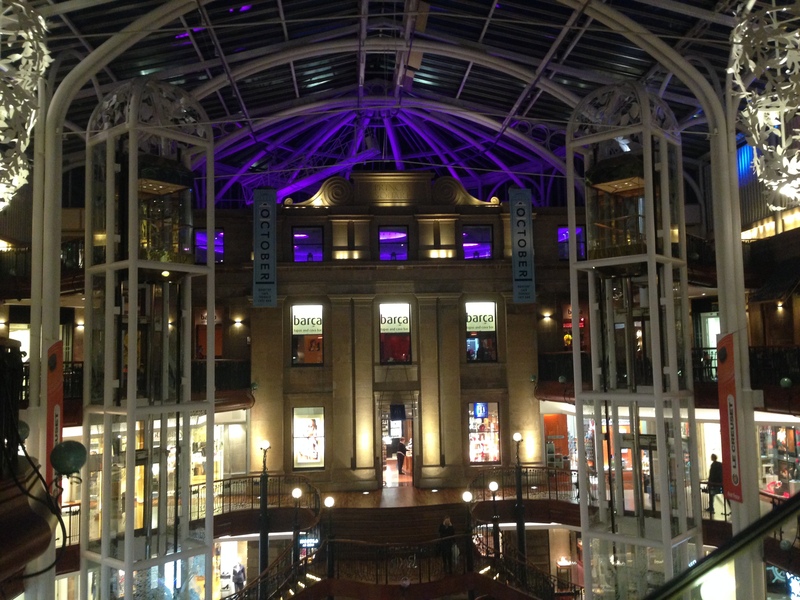 Located on the top floor of Princes Square on Buchanan Street, ‘October’ is a cocktail bar & restaurant that’s quite popular with the after-work city centre crowd. It’s decor and atmosphere quickly make you forget that you’re inside a shopping centre by the time you reach your table and there are various seating options available. You can sit inside at the bar area, where there are also a number of tables, or you can sit out on the balcony, which is a little small, but overlooks the entirety of Princes Square. The menu at October is fairly mixed. There’s a selection of pasta dishes, sandwiches and of course, burgers. Since we’re all about the patty and bun here, we decided to go for the burger. There are three options available: steak, chicken or vegetarian with the option to customise each one with a number of toppings at £1 each. We went for the beef burger and decided to add mature cheddar. The burger was served open on a lightly toasted bun with skinny fries in a separate dish. Presentation wise, it was fairly decent, although there didn’t appear to be much room for the food on the little wooden board at all. The burgers are served open-faced. The patty had a slightly chargrilled flavour, but probably could have done with a little more seasoning. I’d usually prefer my burger slightly more on the medium-side, but this patty wasn’t dry by any means. In fact, it was just about juicy enough without being messy so not many napkins were required to finish this one off. 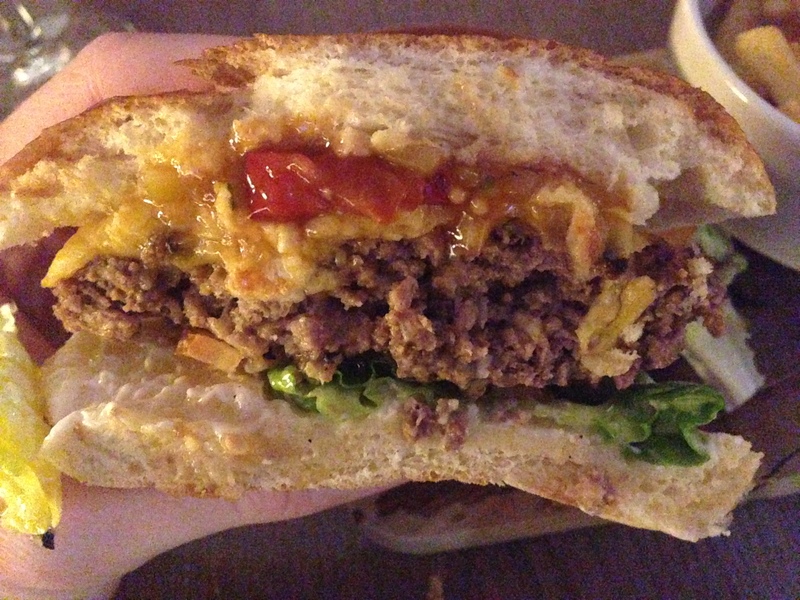 The sharp cheddar was nicely melted and definitely added to the burger and the relish added a peppery, zesty burst to the overall flavour, although the salad at the bottom didn’t really have much of a presence at all. It was fairly bland and seemed to only be there for dressing purposes. 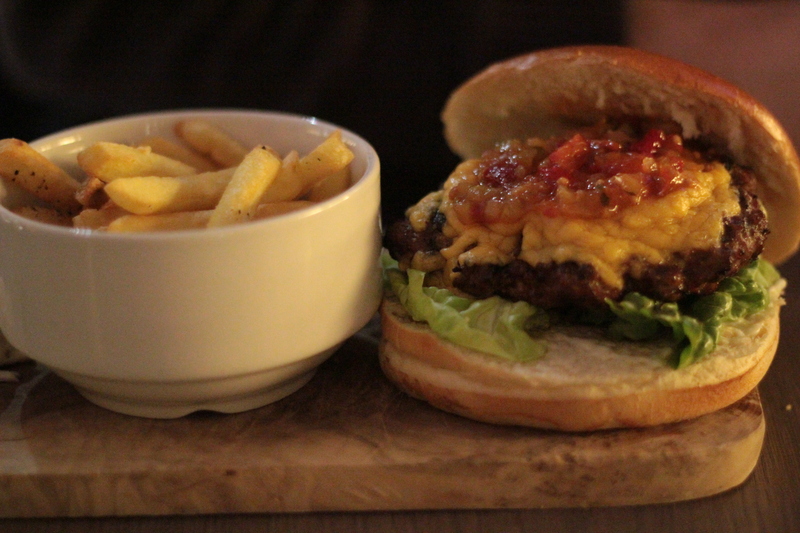 The burger was simple and in terms of the meat and toppings, nothing was bad – just all rather forgettable. I liked the fact that things were kept simple, but a tad more seasoning would have gone a long way to making this burger a whole lot better. My main issue with the burger was the bread to meat ratio. During several bites of the burger, there appeared to be no patty included at all and at times I felt like I was just eating a mouthful of bread and lettuce. The bun wasn’t bad at all, held the contents well and tasted fresh; however, there was just too much of it. A bigger patty or smaller version of the same bun would have worked better. 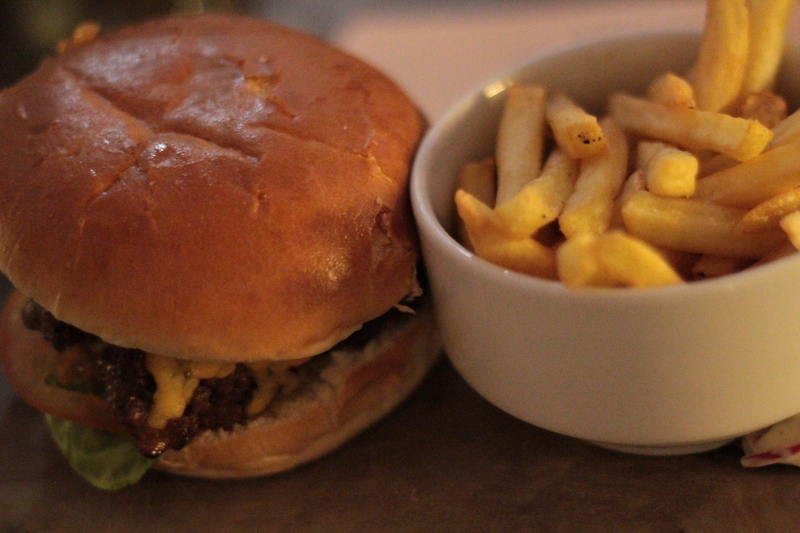 The fries that were served with the burger were decent enough; however, nothing you probably haven’t tasted before. They were nice and crunchy, but incredibly salty, to the point where I was almost coughing trying to eat them. 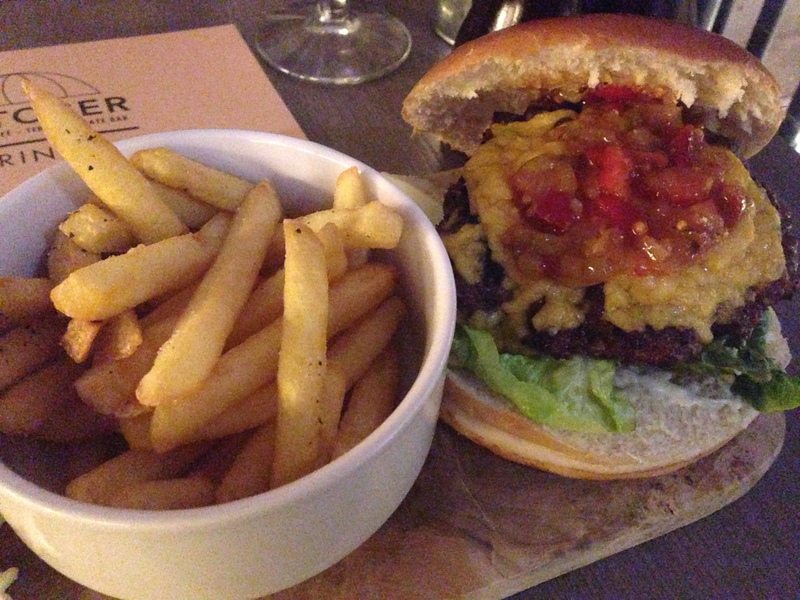 Despite a few minor issues, I liked the burger at October because of its simplicity. While it doesn’t do anything to reinvent the beef patty, it’s certainly not a bad burger by any means. It didn’t really blow me away or make me want to rush back to have it again, but I’d recommend it to anyone who happened to be going there for some food. For the same price or less; however, there are better burgers to be had in Glasgow. A decent enough, but rather unspectacular burger offering. + Sharp cheese was good. + Relish added flavour, without being overpowering. – Patty needed more seasoning. – Too much bread, at times it felt like that was all I was eating. – Fries were incredibly salty. LEGAL / COPYRIGHT INFORMATION James vs. Burger Photography by Pamela Graham is licensed under a Creative Commons Attribution-NonCommercial-NoDerivs 3.0 Unported License. Based on a work at http://www.jamesvsburger.com.